¶ 2 Leave a comment on paragraph 2 0 During the Great Depression, some unemployed adults learned to collect stamps in free classes offered by emergency relief programs. During a time when most Americans had less money to spend on non-essential items, stamp collecting continued to grow as a hobby prompting one observer to note that philatelic advertisement pages thrived in stamp papers. To his surprise, people continued to spend money on things they could not eat.2 To help manage the numbers of unemployed, some municipalities and civic groups offered adult education classes in the arts and in hobbies in the spirit of self-improvement. In New York City, the Emergency Relief Bureau organized and sponsored free classes for residents and in turn employed artists, musicians, and other unemployed people to teach a variety of classes at city recreation centers, parks, and playgrounds beginning in 1932. While classes were open to all residents they were “designed especially for the unemployed,” and over 19,000 adult students enrolled within the first six months. Classes in hobbies such as stamp collecting, photography, and home mechanics were available in these free institutes held across the city. Due to the city’s success, other municipalities in the state emulated those public education programs.3 Local authorities tapped into the network of established hobbyists to instruct fellow citizens who had unexpected free time on their hands. Stamp collecting was branded as a worthy way to spend time. ¶ 5 Leave a comment on paragraph 5 0 Care and Feeding of Hobby Horses, book cover, Hathi Trust. ¶ 7 Leave a comment on paragraph 7 0 A rise in mass cultural offerings—movies, sporting events, amusement parks—troubled Stanley because he saw participants in those activities as being passive: watching rather than playing. Stanley acted politically conservative, worrying about communal bonds formed in public cultural venues. 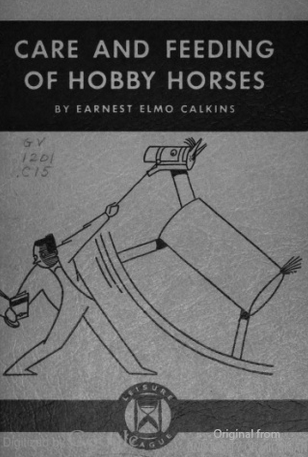 He declared during the first Hobby Round-Up on May 1, 1935, that “May Day is play day” and not a time for “radical demonstrations.”7 Stanley’s statement shifted the focus from offering leisure time activities merely to “cure boredom” to speaking out against radicalism in the name of hobbies. 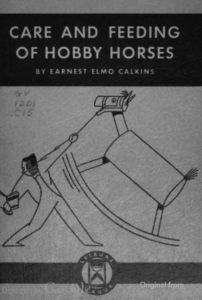 The Hobby Round-Up was Stanley’s way of taking back May Day from the Communists. He pushed hobbies as a way of mollifying increased union activity and New Deal policies that supported workers’ rights. Factory workers and union members did bond through mass culture participation in cities like Chicago in 1930s, which worked to unite previously divided workers in pursuit of common economic and production goals.8 Stanley praised hobbies as individualist pursuits. ¶ 8 Leave a comment on paragraph 8 0 Meant for general audiences, monographs published and distributed by LLA taught the basics of different hobbies, including stamp collecting. The stamp collecting book offered a guide for novices introducing them to collecting practices, philatelic clubs and papers, and a brief history of the postal system. Once again, stamp collecting was described as “purely educational” and had a “beneficial effect upon character.” According to the author, stamp collectors “must have an orderly mind” because they must be “neat, accurate, conscientious, observant, and honest.” He then admitted that it was difficult to ascertain whether these skills were developed or accentuated by stamp collecting, but that they were positive characteristics for all people, nonetheless.9 A publication such as this summarized many of the feelings developed about the worthiness of stamp collecting as a practice and why it should be taught to children and adults alike.